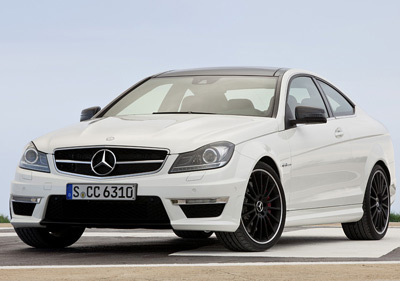 The Mercedes-Benz C63 AMG Coupe is the hotted-up, AMG-fettled version of the new C-Class Coupe. The Mercedes C63 AMG Coupe is powered by a 6.3 litre V8 engine which - in standard guise - produces 451 horsepower and 443 lb-ft of torque. With this engine the C63 AMG Coupe can reach 60 mph in 4.4 seconds and go on to an electronically limited top speed of 155 mph. However if the optional 'AMG Development Pack' is fitted, the power output rises to 481 hp, the 0-60 time is reduced by 1/10th of a second, and the top speed rises to 174 mph. 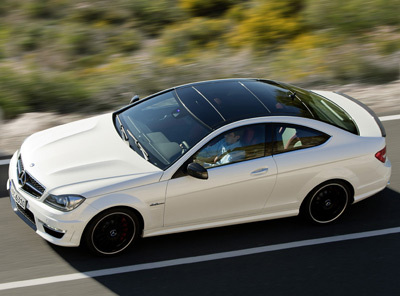 The AMG Development Pack for the C63 AMG Coupe consists of engine modifications inspired by the SLS AMG supercar. The forged pistons, connecting rods and lightweight crankshaft save 6.6 pounds in weight. These changes reduce rotational inertia within the engine and enhance the overall agility and throttle response. 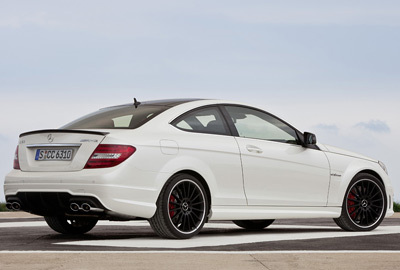 The AMG Development Package is marked out from the standard C63 AMG Coupe by the titanium grey variable intake manifold, the AMG high-performance braking system with two-piece front rotors and red painted brake calipers, the carbon fiber trunk lid spoiler and the AMG performance sports steering wheel in premium leather with an Alcantara grip area. 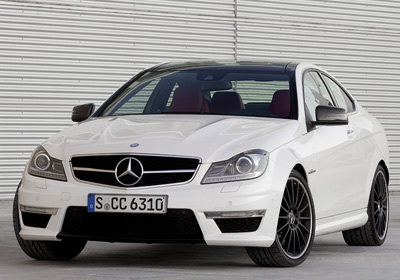 The Mercedes C63 AMG Coupe's transmission is the AMG SPEEDSHIFT MCT 7-speed unit. This semi-auto transmission offers a variety of modes, including the Controlled Efficiency "C" mode which provides early, comfortable upshifts while maintaining the lowest possible engine speed and "soft" accelerator characteristics to help improve fuel economy. Of course the overwhelming majority of AMG drivers will probably make more use of the "S", "S+" and "M" modes which deliver increased performance, faster gearchanges, higher revs and rev-matching. Gear changes in the "S+" and "M" modes take just 100 milliseconds and the RACE START function allows the driver to exploit the vehicle's full acceleration capability. 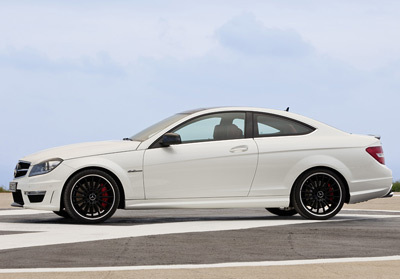 The Mercedes C63 AMG Coupe also features upgraded AMG sports suspension and an AMG high-performance braking system. 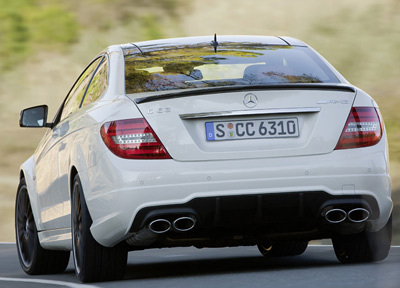 Compared with the standard C-Class Coupe's suspension, the C63 AMG coupe has a separate three-link front suspension, a reinforced multi-link independent rear suspension and a wider track front and rear. This setup has increased negative camber, larger anti-roll bars and specially adjusted spring and damper rates. Visually, the C63 AMG Coupe features a new AMG front bumper housing a high-gloss black center section, AMG-specific LED daytime running lights and side air outlets. The aluminium hood is also unique to the car and features two power bulges. 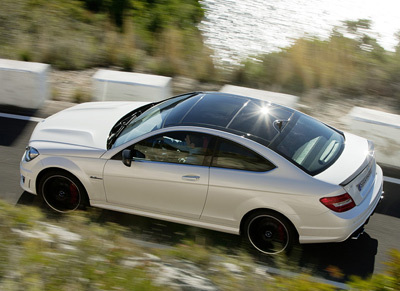 The view from the side is dominated by the titanium grey colored 18-inch wheels and AMG side sills. At the back, the AMG rear apron has a distinctive, black diffuser insert together with two chromed twin tailpipes of the AMG sports exhaust system.